Milan came from behind twice to earn a draw against Roma. Max Allegri made two changes to the side that drew Ajax in the Champions League, as Urby Emanuelson and Andrea Poli were included in the starting eleven. Rudi Garcia also made two changes to the starting eleven that defeated Fiorentina last weekend. Michael Bradley replaced the suspended Miralem Pjanic, while Mattia Destro was selected over Alessandro Florenzi. This was far from a tactical spectacle – Roma took the lead twice, but individual errors, and Allegri’s substitution’s earned Milan a valuable point. Both sides approached the match in different manners when the opposition secured possession, which contributed to Roma’s early dominance. 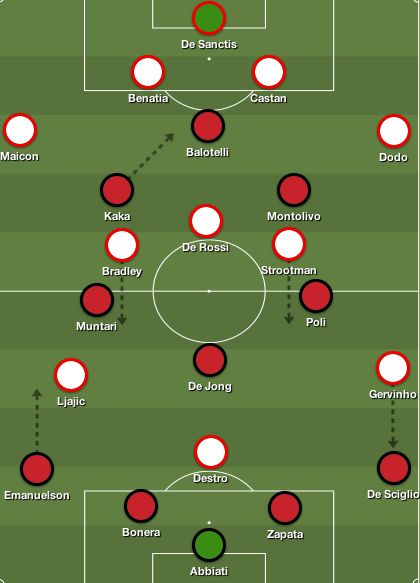 Milan replicated the approach used against Ajax in midweek – Mario Balotelli and Kaka closed down the Roma defenders, while Sulley Muntari and Riccardo Montolivo pushed out wide to press the fullbacks. However, there was more emphasis on limiting Maicon’s freedom to push forward, as Muntari successfully nullified his attacking threat. On the opposing end, Roma occasionally pressed high up the pitch in the early moments, but for the most part, they allowed Milan’s centre backs space to play out of the back. Roma opted to press the midfield, and limit their impact on the match, thus leading to Allegri’s men conceding possession in the opening minutes. Yet, there was a common feat in regards to the way both sides pressed. Neither side focused on pressing the holding midfielder, thus handing Nigel De Jong and Daniele De Rossi the freedom to string passes together. This benefited Milan, as De Rossi struggled to grab a stranglehold of the match, whereas De Jong periodically dictated the tempo and triggered attacks. There was no surprise that both men were the most proficient passers in the match. Based on Roma’s dominance in the opening period, there was no surprise that they took the lead. But, once again, we witness a goal created because half space was penetrated efficiently – similar to Walcott and Hazard’s goal this weekend. The space behind Zapata is the half space Ljajic plays the ball into. Dodo intercepted Mattia De Sciglio’s pass and surged forward, evading De Jong’s pass before playing the ball out wide to Adem Ljajic. Ljajic drifted centrally and played the ball into half space for Strootman to latch onto. Strootman attacked the half space to receive the ball and delivered a cross into the six-yard box, and Destro tapped in Roma’s opener. Roma admirably pressed Milan’s midfield in the first half, which led to their slow start, but as the half wore on, Allegri’s men located an additional route of attack. One of the issues Roma endured in the first half was protection for Maicon. Occasionally, Bradley would tuck in and prevent Milan from overloading the right flank, but for the most part, Ljajic and Gervinho failed to track back. 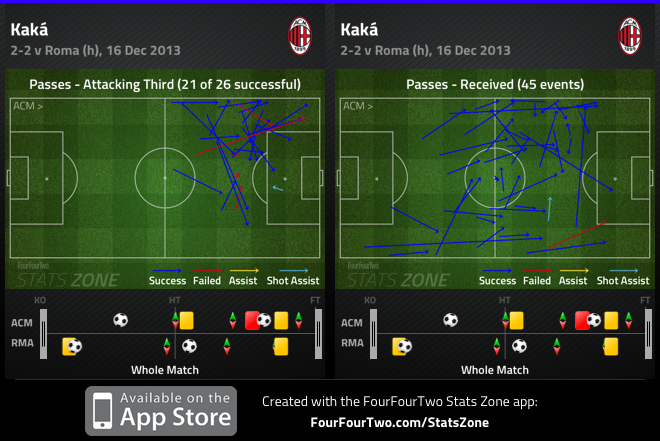 Majority of Milan’s attacks in the first half were off swift transitions led by Kaka. The Brazilian often drifted into key positions to receive the ball, and played quick passes to the left side of the pitch. This was down to Maicon’s narrow positioning, Roma’s lack of numbers at the back, and belief that Emanuelson could get the better of the Brazilian in 1v1 situations. Emanuelson’s ambitious runs into Roma’s third pegged Maicon back, and his delivery from wide areas were somewhat threatening. Specifically, his ability to drift past Bradley and Maicon, forced Morgan De Sanctis to make a key save, which led to the corner that Roma conceded from. Emanuelson’s threat down the left was significant in the first half, as majority of Milan’s attacking threat came through him. Garcia’s men started the second half in fine fashion – they enjoyed their best moments in the opening 15 minutes of the half, but were unable to put the match out of reach. The recurring theme in those opening minutes was exploiting the space behind De Sciglio. The Milan fullback lacked positional discipline for large portions of the match, and he was a liability from a defensive standpoint. 48th min: Poli’s poor back heel falls to Bradley, who pushes forward and plays a long ball into the left channel for Destro to run onto. Destro holds off Zapata, turns him, and plays the ball to Bradley, who finds Maicon, but Zapata cleared his cross. 49th min: Subsequently, Strootman picks up a loose ball and plays in Gervinho down the left flank, but Gabriel jumps off his line and commits a reckless challenge in the box, to earn Garcia’s men a penalty – which Strootman converted. 54th min: Dodo dispossessed De Sciglio and played Gervinho forward into open space on the left flank. Gervinho drove at the Milan defence but his ball to Ljajic was intercepted. Ljajic begins his run at half as Gervinho attacks the space behind De Sciglio. This is the end of Ljajic’s run as Gervinho plays him in. 58th min: Dodo intercepts Balotelli’s final ball, and plays a pass to Gervinho in acres of space on the left. The Ivorian attacks Zapata, and Ljajic makes a run behind him and receives a disguising pass. Ljajic plays the ball across the box to Gervinho, but Emanuelson makes a lovely tackle to prevent a shot. Milan pushed higher up the pitch in the second half, but this provided Roma with space to penetrate on the counter, however Garcia’s men were poor in the final third. Garcia made a pivotal player swap in the 63rd minute by sacrificing Destro for Francesco Totti – who appeared for the first time since October. This change played a significant factor in Roma’s dominance, and it allowed Milan some breathing space. It’s undeniable that Totti is arguably Roma’s best attacker, but Destro’s contribution to the match provided Roma with the platform to threaten Milan in wide areas. Destro’s physical presence occupied the two centrebacks, while Totti often drifted into midfield. During the final half hour, Allegri’s fullbacks were cautious with their forward movement, and Milan’s centrebacks sat deep – so Totti’s movement didn’t drag Milan’s backline out of position. 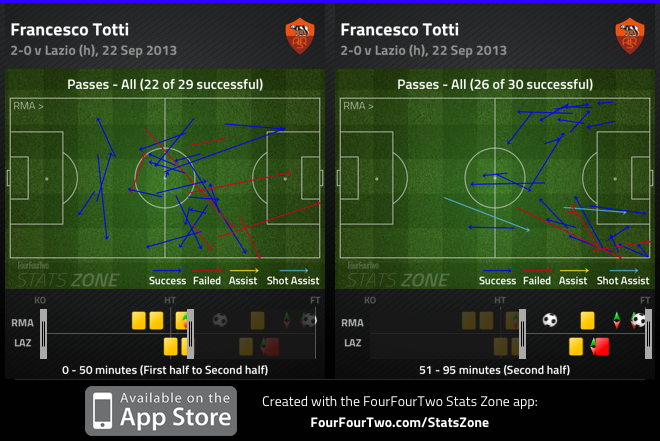 Suddenly there was no space for Roma to penetrate out wide, and their centre backs were rarely tested. Allegri reacted quickly to Garcia’s decision to introduce Totti. Alessandro Matri replaced Poli, and Milan became 4-3-1-2 with Kaka roaming behind the two strikers. Allegri goes 4-3-1-2 allowing Kaka freedom in the final third. 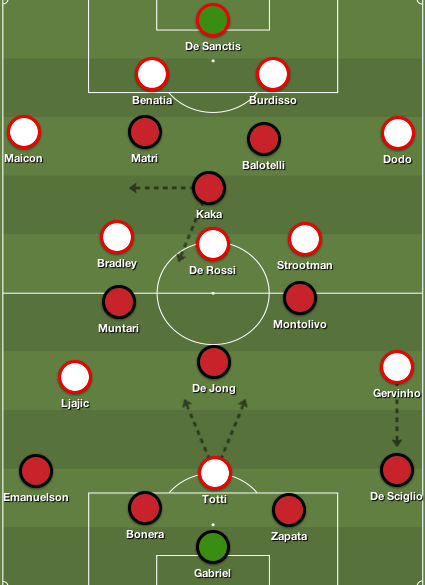 Now, Milan competed in midfield, and Balotelli had more freedom to drop deeper and link play. Prior to Matri’s inclusion, Balotelli struggled against the two Roma centrebacks, but Allegri’s switch allowed the Italian striker freedom in attack. Roma’s midfielders became sloppy in possession, and lost control of the match, as Montolivo and Muntari constantly closed them down and broke into tackles. Eventually, Milan gained control of the midfield, Balotelli became a more prominent figure, and Kaka roamed around the final third with a purpose. The Brazilian was the most influential Milan player on the pitch. In the first half he was restricted to the left flank, but he drifted centrally to receive the ball and initiate quick counter attacks. However, when Allegri went 4-3-1-2 he was given more freedom to express himself. The one key component to his success against Roma was his positional awareness. Kaka dropped deeper into midfield to help build attacks, located pockets of space effortlessly, and drifted from flank to flank to link play with the fullbacks. 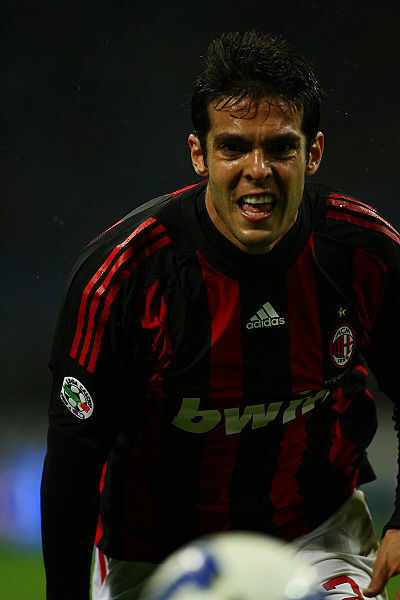 Kaka was the lynchpin behind Milan’s best chances in the final 15 minutes of the match. His nonchalant run into the final third, led to Balotelli laying the ball off to Muntari, who dropped his shoulder, bet Dodo, and levelled the match. While, his incisive penetrating ball into Montolivo, led to Balotelli’s spurned opportunity in injury time. This isn’t the Kaka the world grew to adore, but Allegri’s tactical change surely provided glimpses of his brilliance. Roma have been brilliant over the course of the season, but their overachievement has led to a sense of complacency. By no means did they produce an outstanding performance, but they were the superior side for large portions of the match, and failed to take their chances – frankly, it’s been a recurring theme in their last five or six matches. As for Milan, although they dropped points, this was still a positive result. They showcased their resilience, and Allegri’s changes ignited a late resurgence that should’ve led to three points. In hindsight, while Milan can use this as a confidence boost heading into the derby, Roma’s dropped points sees Juventus extend their lead at the top of the table to five points. The summer sales of Erik Lamela, Pablo Osvaldo and Bojan Krkic left many questioning Roma’s front-line heading into the new season, however a certain Serbian attacker is slowly silencing those critics. Adem Ljajic’s arrival in the second half turned the tide for the Giallorossi as they earned their 48th Rome derby victory. Prior to the Serbian attacker’s introduction, the match looked certain to end in a draw. Vladimir Petkovic’s cautious approach saw his side sit off in their half, maintaining a solid foundation in a 4-1-4-1, but this left lone striker Miroslav Klose isolated upfront. Alvaro Gonzalez and Hernanes pressed Kevin Strootman and Miralem Pjanic, leaving Daniele De Rossi free to play passes, but the Italian didn’t have a significant impact on the match. 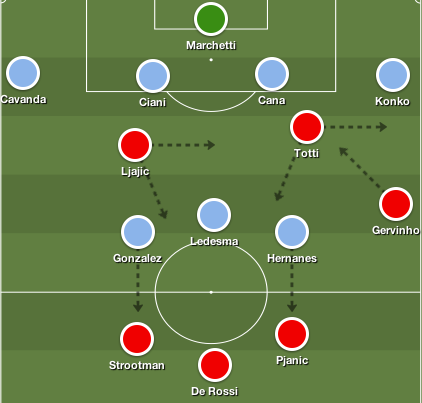 Due to Lazio’s ability to contain Roma’s midfield, Rudi Garcia’s attacking three didn’t receive many opportunities to cause havoc in the final third. Gervinho scampered down the flanks lacking quality in the final third – while Francesco Totti was forced to drop deep into midfield to receive the ball and Alessandro Florenzi was a limited option on the opposing flank. Frankly, it was a poor half from both sides that resulted in no shots on target, minimal Lazio attacking threats – besides Antonio Candreva and Senad Lulic bombing down the flanks – and Garcia’s men unable to get behind the Lazio backline. Six minutes into the second half, Garcia decided to introduce Ljajic for the disappointing Florenzi, and this is when Roma – specifically Totti – grew into the match. Ljajic, celebrating his 22nd birthday, drifted around the final third linking play on each flank – he found pockets of space in key areas to receive the ball, and dropped deeper into midfield to provide an extra passing outlet. The Serbian attacker provided an attacking element – his immaculate off-the-ball movement – that freed up space for his teammates to slot into. Maicon and Federico Balzaretti surged forward to help create overloads, and Totti, who had himself a frustrating first half, found spaces in wide areas to provide Roma with the creativity they lacked prior to Ljajic’s arrival. Balzaretti and Totti benefitted from the Serbian’s second half cameo the most, as the Roma captain was no longer the creative focal point, while Balzaretti had space to attack due to Lazio’s narrow shape. And it took 11 minutes for the duo to combine as Totti drifted to the right flank and played a lovely ball to the advancing Roma fullback, but he drove his shot off the post. Seconds later, Totti played a short corner, received the ball back, and delivered a lovely cross to an unmarked Balzaretti, and this time the Italian put the ball past Federico Marchetti. Petkovic brought on an extra striker, two midfielders, and altered his formation, but an Andre Dias red card – minutes after his introduction – ended Lazio’s chances of snagging an equalizer. Nevertheless, Ljajic continued to impact the match, combining with Balzaretti again, which led to substitute Marco Borriello nodding the Italian fullback’s cross at Marchetti. But, in the dying minutes of injury time, Ljajic received a pass on the edge of the box, awing the Lazio defence with his footwork, then squirming into space, where he was fouled, handing Roma a late penalty. The birthday boy confidently stepped to the spot, scoring his second goal of the season – off the bench – for the Giallorossi, as their perfect record stays intact. Ljajic has yet to complete a full 90 minutes for Roma, but he continues to display why he’ll be a pivotal component to their success this season. His persistence to roam around the final third linking play, score goals, and provide space for his teammates is beneficial against well-organized sides. Roma struggled in the first half, but Ljajic’s work rate in the final third led to the Giallorossi’s second half superiority against a good Lazio side.